There are over 32,000 datasets hosted and/or maintained by NASA; these datasets cover topics from Earth science to aerospace engineering to management of NASA itself. We can use the metadata for these datasets to understand the connections between them. What is metadata? Metadata is a term that refers to data that gives information about other data; in this case, the metadata informs users about what is in these numerous NASA datasets but does not include the content of the datasets themselves. The metadata includes information like the title of the dataset, a description field, what organization(s) within NASA is responsible for the dataset, keywords for the dataset that have been assigned by a human being, and so forth. NASA places a high priority on making its data open and accessible, even requiring all NASA-funded research to be openly accessible online. The metadata for all its datasets is publicly available online in JSON format. In this chapter, we will treat the NASA metadata as a text dataset and show how to implement several tidy text approaches with this real-life text. We will use word co-occurrences and correlations, tf-idf, and topic modeling to explore the connections between the datasets. Can we find datasets that are related to each other? Can we find clusters of similar datasets? 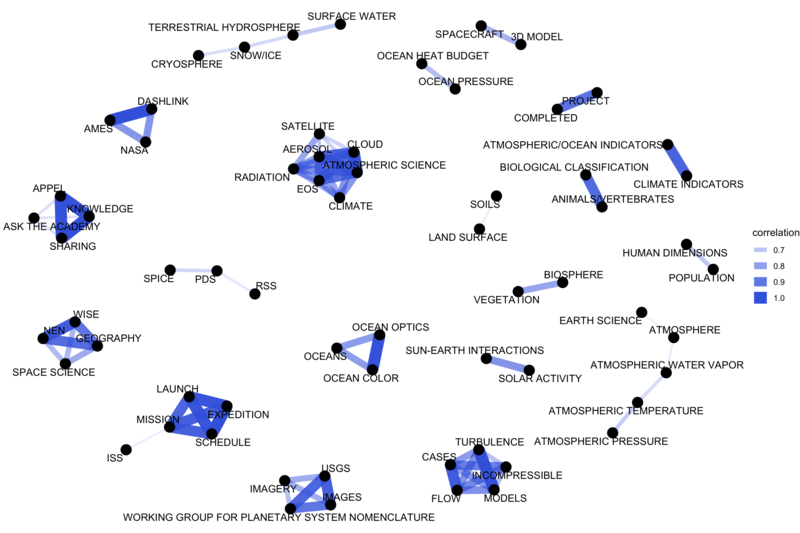 Since we have several text fields in the NASA metadata, most importantly the title, description, and keyword fields, we can explore the connections between the fields to better understand the complex world of data at NASA. This type of approach can be extended to any domain that deals with text, so let’s take a look at this metadata and get started. First, let’s download the JSON file and take a look at the names of what is stored in the metadata. ##   "_id"                "@type"              "accessLevel"        "accrualPeriodicity"
##   "bureauCode"         "contactPoint"       "description"        "distribution"
##   "identifier"         "issued"             "keyword"            "landingPage"
##  "language"           "modified"           "programCode"        "publisher"
##  "spatial"            "temporal"           "theme"              "title"
##  "license"            "isPartOf"           "references"         "rights"
We see here that we could extract information from who publishes each dataset to what license they are released under. It seems likely that the title, description, and keywords for each dataset may be most fruitful for drawing connections between datasets. Let’s check them out. The title and description fields are stored as character vectors, but the keywords are stored as a list of character vectors. Let’s set up separate tidy data frames for title, description, and keyword, keeping the dataset ids for each so that we can connect them later in the analysis if necessary. These are just a few example titles from the datasets we will be exploring. Notice that we have the NASA-assigned ids here, and also that there are duplicate titles on separate datasets. Here we see the first part of several selected description fields from the metadata. Now we can build the tidy data frame for the keywords. For this one, we need to use unnest() from tidyr, because they are in a list-column. This is a tidy data frame because we have one row for each keyword; this means we will have multiple rows for each dataset because a dataset can have more than one keyword. Now it is time to use tidytext’s unnest_tokens() for the title and description fields so we can do the text analysis. Let’s also remove stop words from the titles and descriptions. We will not remove stop words from the keywords, because those are short, human-assigned keywords like “RADIATION” or “CLIMATE INDICATORS”. These are now in the tidy text format that we have been working with throughout this book, with one token (word, in this case) per row; let’s take a look before we move on in our analysis. 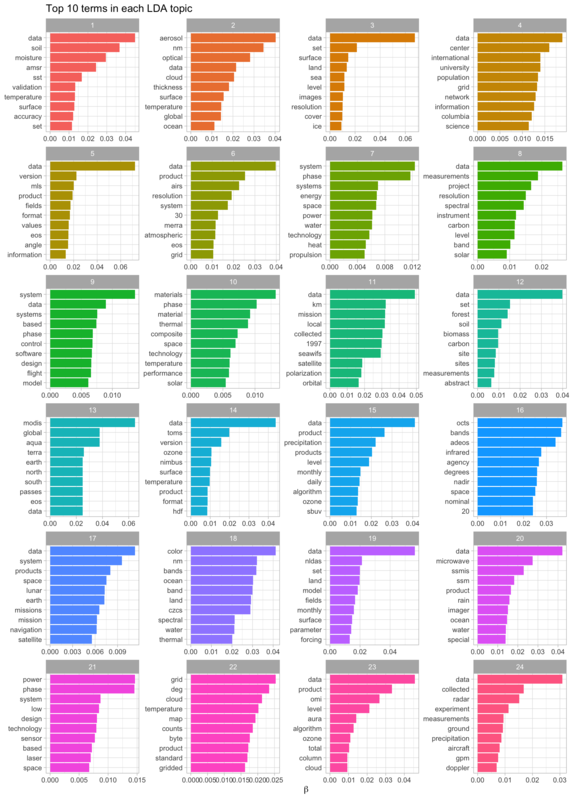 What are the most common words in the NASA dataset titles? We can use count() from dplyr to check this out. Words like “data” and “global” are used very often in NASA titles and descriptions. We may want to remove digits and some “words” like “v1” from these data frames for many types of analyses; they are not too meaningful for most audiences. We can do this by making a list of custom stop words and using anti_join() to remove them from the data frame, just like we removed the default stop words that are in the tidytext package. This approach can be used in many instances and is a great tool to bear in mind. What are the most common keywords? We likely want to change all of the keywords to either lower or upper case to get rid of duplicates like “OCEANS” and “Oceans”. Let’s do that here. 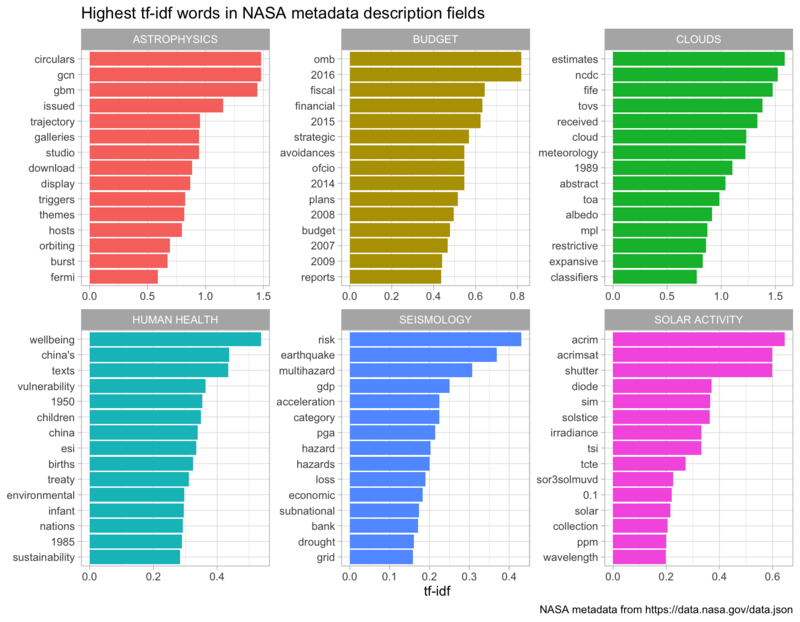 As a next step, let’s examine which words commonly occur together in the titles, descriptions, and keywords of NASA datasets, as described in Chapter 4. We can then examine word networks for these fields; this may help us see, for example, which datasets are related to each other. We can use pairwise_count() from the widyr package to count how many times each pair of words occurs together in a title or description field. These are the pairs of words that occur together most often in title fields. Some of these words are obviously acronyms used within NASA, and we see how often words like “project” and “system” are used. These are the pairs of words that occur together most often in descripton fields. “Data” is a very common word in description fields; there is no shortage of data in the datasets at NASA! Let’s plot networks of these co-occurring words so we can see these relationships better in Figure 8.1. We will again use the ggraph package for visualizing our networks. We see some clear clustering in this network of title words; words in NASA dataset titles are largely organized into several families of words that tend to go together. What about the words from the description fields? 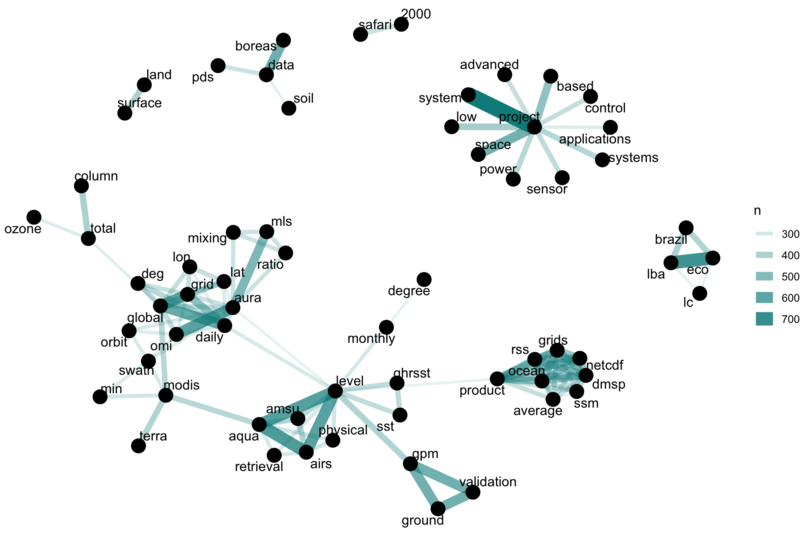 Figure 8.2 shows such strong connections between the top dozen or so words (words like “data”, “global”, “resolution”, and “instrument”) that we do not see clear clustering structure in the network. We may want to use tf-idf (as described in detail in Chapter 3) as a metric to find characteristic words for each description field, instead of looking at counts of words. Next, let’s make a network of the keywords in Figure 8.3 to see which keywords commonly occur together in the same datasets. 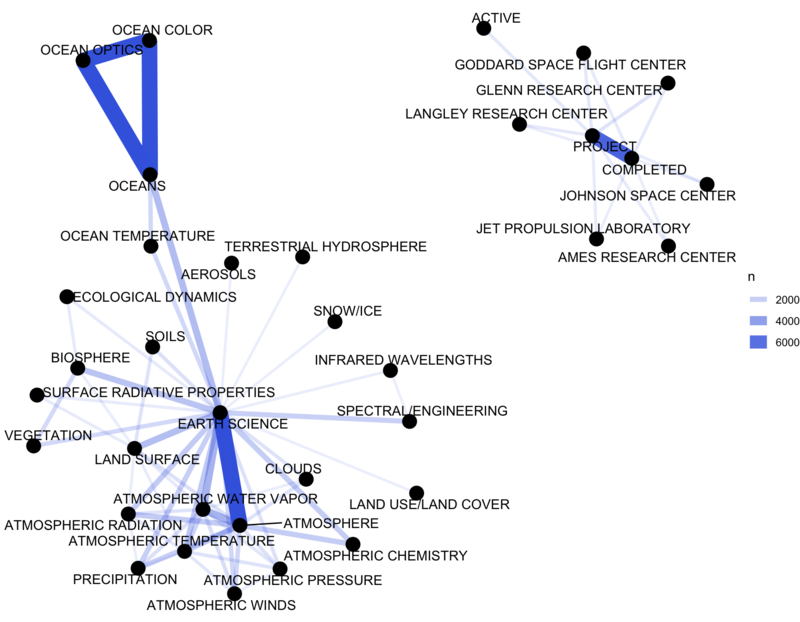 We definitely see clustering here, and strong connections between keywords like “OCEANS”, “OCEAN OPTICS”, and “OCEAN COLOR”, or “PROJECT” and “COMPLETED”. These are the most commonly co-occurring words, but also just the most common keywords in general. To examine the relationships among keywords in a different way, we can find the correlation among the keywords as described in Chapter 4. This looks for those keywords that are more likely to occur together than with other keywords for a dataset. ##  1 KNOWLEDGE           SHARING           1. Notice that these keywords at the top of this sorted data frame have correlation coefficients equal to 1; they always occur together. This means these are redundant keywords. It may not make sense to continue to use both of the keywords in these sets of pairs; instead, just one keyword could be used. 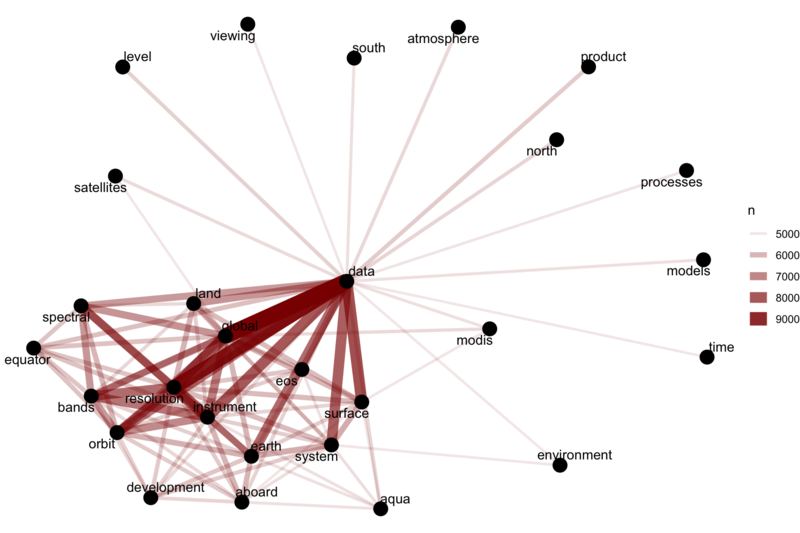 Let’s visualize the network of keyword correlations, just as we did for keyword co-occurences. This network in Figure 8.4 appears much different than the co-occurence network. The difference is that the co-occurrence network asks a question about which keyword pairs occur most often, and the correlation network asks a question about which keywords occur more often together than with other keywords. Notice here the high number of small clusters of keywords; the network structure can be extracted (for further analysis) from the graph_from_data_frame() function above. The network graph in Figure 8.2 showed us that the description fields are dominated by a few common words like “data”, “global”, and “resolution”; this would be an excellent opportunity to use tf-idf as a statistic to find characteristic words for individual description fields. As discussed in Chapter 3, we can use tf-idf, the term frequency times inverse document frequency, to identify words that are especially important to a document within a collection of documents. Let’s apply that approach to the description fields of these NASA datasets. We will consider each description field a document, and the whole set of description fields the collection or corpus of documents. We have already used unnest_tokens() earlier in this chapter to make a tidy data frame of the words in the description fields, so now we can use bind_tf_idf() to calculate tf-idf for each word. What are the highest tf-idf words in the NASA description fields? These are the most important words in the description fields as measured by tf-idf, meaning they are common but not too common. Notice we have run into an issue here; both \(n\) and term frequency are equal to 1 for these terms, meaning that these were description fields that only had a single word in them. If a description field only contains one word, the tf-idf algorithm will think that is a very important word. Depending on our analytic goals, it might be a good idea to throw out all description fields that have very few words. We now know which words in the descriptions have high tf-idf, and we also have labels for these descriptions in the keywords. Let’s do a full join of the keyword data frame and the data frame of description words with tf-idf, and then find the highest tf-idf words for a given keyword. Let’s plot some of the most important words, as measured by tf-idf, for a few example keywords used on NASA datasets. First, let’s use dplyr operations to filter for the keywords we want to examine and take just the top 15 words for each keyword. Then, let’s plot those words in Figure 8.5. Using tf-idf has allowed us to identify important description words for each of these keywords. Datasets labeled with the keyword “SEISMOLOGY” have words like “earthquake”, “risk”, and “hazard” in their description, while those labeled with “HUMAN HEALTH” have descriptions characterized by words like “wellbeing”, “vulnerability”, and “children.” Most of the combinations of letters that are not English words are certainly acronyms (like OMB for the Office of Management and Budget), and the examples of years and numbers are important for these topics. The tf-idf statistic has identified the kinds of words it is intended to, important words for individual documents within a collection of documents. Using tf-idf as a statistic has already given us insight into the content of NASA description fields, but let’s try an additional approach to the question of what the NASA descriptions fields are about. We can use topic modeling as described in Chapter 6 to model each document (description field) as a mixture of topics and each topic as a mixture of words. 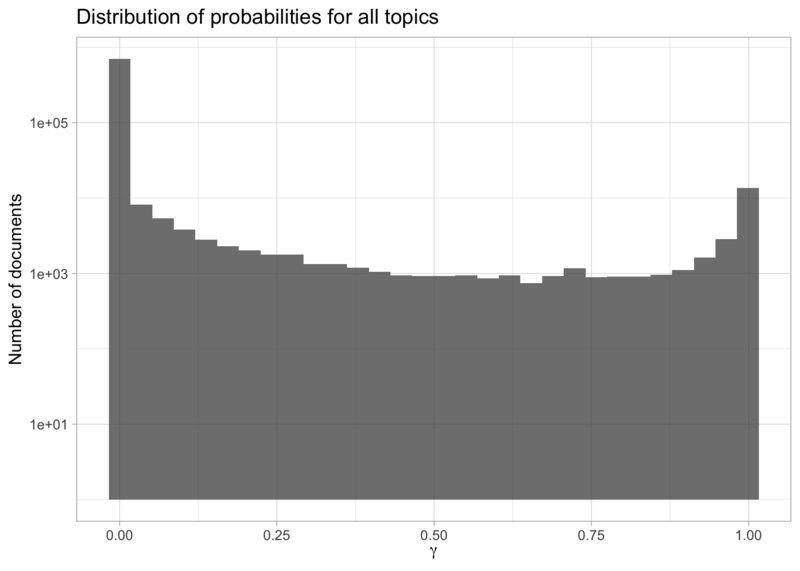 As in earlier chapters, we will use latent Dirichlet allocation (LDA) for our topic modeling; there are other possible approaches for topic modeling. To do the topic modeling as implemented here, we need to make a DocumentTermMatrix, a special kind of matrix from the tm package (of course, this is just a specific implementation of the general concept of a “document-term matrix”). Rows correspond to documents (description texts in our case) and columns correspond to terms (i.e., words); it is a sparse matrix and the values are word counts. Let’s clean up the text a bit using stop words to remove some of the nonsense “words” leftover from HTML or other character encoding. We can use bind_rows() to add our custom stop words to the list of default stop words from the tidytext package, and then all at once use anti_join() to remove them all from our data frame. This is the information we need, the number of times each word is used in each document, to make a DocumentTermMatrix. We can cast() from our tidy text format to this non-tidy format as described in detail in Chapter 5. We see that this dataset contains documents (each of them a NASA description field) and terms (words). Notice that this example document-term matrix is (very close to) 100% sparse, meaning that almost all of the entries in this matrix are zero. Each non-zero entry corresponds to a certain word appearing in a certain document. Now let’s use the topicmodels package to create an LDA model. How many topics will we tell the algorithm to make? This is a question much like in \(k\)-means clustering; we don’t really know ahead of time. We tried the following modeling procedure using 8, 16, 24, 32, and 64 topics; we found that at 24 topics, documents are still getting sorted into topics cleanly but going much beyond that caused the distributions of \(\gamma\), the probability that each document belongs in each topic, to look worrisome. We will show more details on this later. 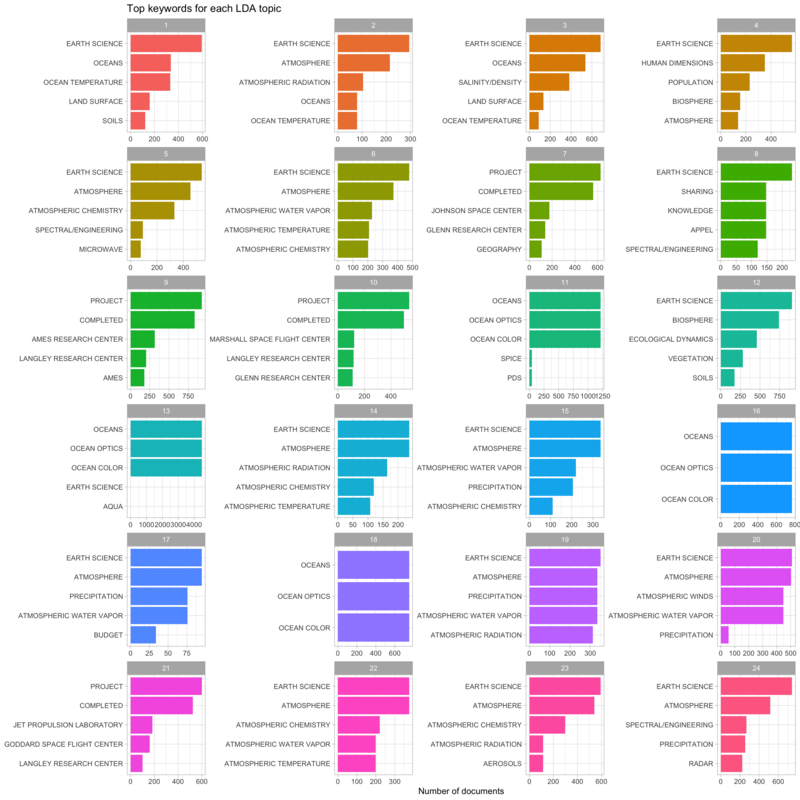 ## A LDA_VEM topic model with 24 topics. This is a stochastic algorithm that could have different results depending on where the algorithm starts, so we need to specify a seed for reproducibility as shown here. Now that we have built the model, let’s tidy() the results of the model, i.e., construct a tidy data frame that summarizes the results of the model. The tidytext package includes a tidying method for LDA models from the topicmodels package. The column \(\beta\) tells us the probability of that term being generated from that topic for that document. It is the probability of that term (word) belonging to that topic. Notice that some of the values for \(\beta\) are very, very low, and some are not so low. What is each topic about? Let’s examine the top 10 terms for each topic. It is not very easy to interpret what the topics are about from a data frame like this so let’s look at this information visually in Figure 8.6. We can see what a dominant word “data” is in these description texts. In addition, there are meaningful differences between these collections of terms, from terms about soil, forests, and biomass in topic 12 to terms about design, systems, and technology in topic 21. The topic modeling process has identified groupings of terms that we can understand as human readers of these description fields. We just explored which words are associated with which topics. Next, let’s examine which topics are associated with which description fields (i.e., documents). We will look at a different probability for this, \(\gamma\), the probability that each document belongs in each topic, again using the tidy verb. Notice that some of the probabilites visible at the top of the data frame are low and some are higher. Our model has assigned a probability to each description belonging to each of the topics we constructed from the sets of words. How are the probabilities distributed? Let’s visualize them (Figure 8.7). First notice that the y-axis is plotted on a log scale; otherwise it is difficult to make out any detail in the plot. Next, notice that \(\gamma\) runs from 0 to 1; remember that this is the probability that a given document belongs in a given topic. There are many values near zero, which means there are many documents that do not belong in each topic. Also, there are many values near \(\gamma = 1\); these are the documents that do belong in those topics. This distribution shows that documents are being well discriminated as belonging to a topic or not. We can also look at how the probabilities are distributed within each topic, as shown in Figure 8.8. Let’s look specifically at topic 18 in Figure 8.8, a topic that had documents cleanly sorted in and out of it. There are many documents with \(\gamma\) close to 1; these are the documents that do belong to topic 18 according to the model. There are also many documents with \(\gamma\) close to 0; these are the documents that do not belong to topic 18. Each document appears in each panel in this plot, and its \(\gamma\) for that topic tells us that document’s probability of belonging in that topic. This plot displays the type of information we used to choose how many topics for our topic modeling procedure. When we tried options higher than 24 (such as 32 or 64), the distributions for \(\gamma\) started to look very flat toward \(\gamma = 1\); documents were not getting sorted into topics very well. Let’s connect these topic models with the keywords and see what relationships we can find. We can full_join() this to the human-tagged keywords and discover which keywords are associated with which topic. Now we can use filter() to keep only the document-topic entries that have probabilities (\(\gamma\)) greater than some cut-off value; let’s use 0.9. What are the top keywords for each topic? It’s interesting that the keywords for topics 13, 16, and 18 are essentially duplicates of each other (“OCEAN COLOR”, “OCEAN OPTICS”, “OCEANS”), because the top words in those topics do exhibit meaningful differences, as shown in Figure 8.6. 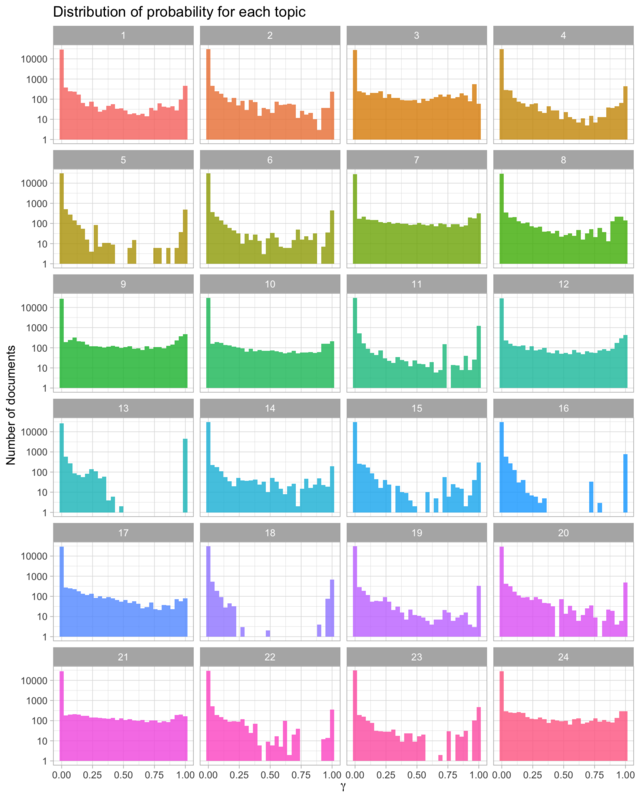 Also note that by number of documents, the combination of 13, 16, and 18 is quite a large percentage of the total number of datasets represented in this plot, and even more if we were to include topic 11. By number, there are many datasets at NASA that deal with oceans, ocean color, and ocean optics. We see “PROJECT COMPLETED” in topics 9, 10, and 21, along with the names of NASA laboratories and research centers. Other important subject areas that stand out are groups of keywords about atmospheric science, budget/finance, and population/human dimensions. We can go back to Figure 8.6 on terms and topics to see which words in the description fields are driving datasets being assigned to these topics. For example, topic 4 is associated with keywords about population and human dimensions, and some of the top terms for that topic are “population”, “international”, “center”, and “university”. By using a combination of network analysis, tf-idf, and topic modeling, we have come to a greater understanding of how datasets are related at NASA. Specifically, we have more information now about how keywords are connected to each other and which datasets are likely to be related. The topic model could be used to suggest keywords based on the words in the description field, or the work on the keywords could suggest the most important combination of keywords for certain areas of study.